Still grey here but the ducks are snacking. They are still a bit skittish. I have to throw the food far. But they know me and know I’m there to feed them so I am not sure why the theatrics over eating the food I bring. The question is : why is Honey so skittish this year? Please let me have your hypotheses. This entry was written by whyevolutionistrue and posted on September 8, 2018 at 1:00 pm and filed under ducks. Bookmark the permalink. Follow any comments here with the RSS feed for this post. Both comments and trackbacks are currently closed. She’s worried about whether all her kids will go to college and thrive in this Trumpian era. I hope Trump at least isn’t an enthusiastic hunter like Sarah Palin (and one of our ex-presidents). She has a heavy beau and is afraid that you might be critical. Honey is a more mature, experienced Ms. 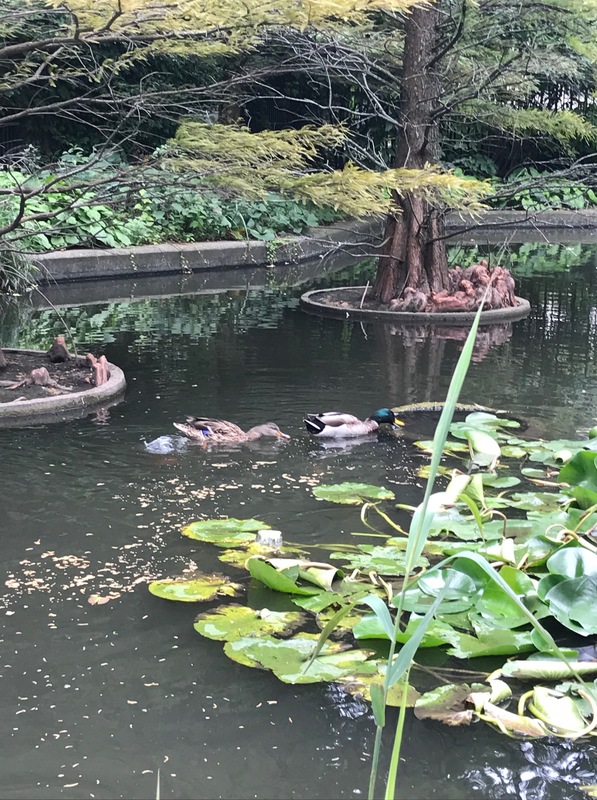 Wisdom Duck compared to last year when she could be hand fed – after all she was raised on the genteel UofC campus – she’s an urban Duck used to mixing with the intellectual elite! But today she’s wiser & knows she’ll be fed at a distance & she’s not competing for food right now – so why risk getting close? On her winter vacation travels she’s seen first wing what happens to Ms. Trusting Duck down in the Mississippi Delta: Hoomans with firesticks, snakes, American crows, mink, foxes, coyotes, raccoons, skunks, snapping turtles, eagles & hawks. Then there’s the alligator that’s making a comeback. She may even have tried to raise a brood down there & it didn’t go so well for her eggs & chicklets. Domesticated animals are bred to retain their juvenile characteristics such as playfulness and being more trustful of humans. So, I’m guessing that Honey was more trusting last year because she wasn’t as mature then. The onset of winter is playing on her neurons and the departure from a steady and reliable nutritional source is a dilemma for her duck brain. It’s long past her last departure day and it is now getting critical, hence the nervous skittish behaviour. Pond is just exacerbating the situation by not getting on his bike and moving off as well. I’m assuming a Chicago winter is not something they are familiar with but a diminishing food supply would normally indicate along with temperature, genetic impulse, give rise to the urge to take to the skies. A push / pull, should i go or should i stay and it’s not personal, it’s confusion bought on by that tension. You might have to buy a couple of bus tickets south if they don’t get their act together. Ahem, I think the correct nomenclature is should I stay or should I go. Just helping out lest Mick Jones reads this site. Why do I even try doing html code? grrr. WordPress!!! She is thinking about becoming a quacker, and knows you won’t approve. Honey is a year older and wiser, and I suspect that she’s had some scares, like the time when she was missing early on in the season. Some big critter might be lurking about on campus. Or she might have PTSD after the Botany Pond chainsaw reed massacre. Yes, that’s what I had thought and commented (also wondered about his absences this year) in Jerry’s previous duck post, but he said that Honey had been skittish ALL this season, even before the infamous chainsaw reed massacre. Apparently she used to eat out of his hand last year. I think Michael is right that she’s older and more wary of humans now. Agree that the upcoming migration probably enters Duck Consciousness in some way shape or form. Besides that, animals are super sensitive to small changes – they know Anna, but are they used to her by herself, or are they more familiar with her appearing with you and / or other familiar people? Hypothesis 1: She has a new boyfriend. Hypothesis 2: She has a wounded heart since her first beau is missing in far off California. Hypothesis 3: All of the above. She has seen a lurking bottle of Hoisin sauce ?